The Phillips Collection in D.C. recently concluded its exhibition on Vincent van Gogh's repetitions. Repetitions is a word that van Gogh used to describe closely related versions of the same subject. van Gogh painted subjects in repetition in order to experiment with color relationships and brushstrokes. He also seemed obsessive about keeping some details exactly the same in repetitive paintings---using precise measuring tools to make sure the distance between the eyes of a subject were the same. Here is an example of a painting that van Gogh repeated--The Road Menders. In this painting, van Gogh highlights two of his major subject matters--nature and the difficult life of the working poor. With the use of color, van Gogh changes the focus of subjects in the painting from workers (one of the left with workers) and trees (one on the right with the workers somewhat faded). van Gogh worked quickly, sketching out a painting in 45 minutes rapidly from life. The Phillips Collection commented that he would take the sketch back to his studio to repeat the subject, reworking and refining the subject on canvas after canvas to "extract the essence of the motif." I love that idea--reworking and refining the subject on canvas after canvas to extract the essence of the motif. I saw this exhibit a few days after listening to an NPR interview with Bruce Springsteen on his new album, High Hopes. In the interview, Springsteen talks about his creative process and his own style of repetitions. Springsteen talks about how he writes a song and it may not make it on the album in the making. But he holds on to the song. And holds on to it. And holds on to it until the time is right. The song gets nuanced a bit and makes it on to the current album. Specifically, Springsteen talks about the song "The Ghost of Tom Joad." The song was originally written as a rock song for the E Street Band but they weren't quite able to pull it off. Springsteen then made an acoustic album where the song appeared in acoustic genre. Now on the album, High Hopes, Springsteen and Tom Morello (rock god!) pull off the song the way Springsteen originally intended. Springsteen and Morello on the Ghost of Tom Joad. Tom Joad was first written in 1995. Springsteen has been working with this song, "extracting the essence," for almost 20 years. Springsteen has his own version of repetitions. While van Gogh focused on brushstrokes and color to get at the essence, Springsteen uses cords and vocals to do the same. And....van Gogh and Springsteen's works both focus the lives of the working poor. I love the lectionary because it repeats and it allows me to "extract the essence" of the story. I can come back to a story over time, see it with various nuances and noodle over details. Over a three year period, we hear a greater portion of the Biblical narratives. And then we repeat. And repeat again. And I keep coming back to the same work of art--a Biblical story. Extracting essence takes time--sometimes years--and the discipline of the lectionary invites me into the process of repetition. The subject matter in van Gogh's paintings didn't change. The words to Tom Joad didn't change. Biblical narratives don't change. But light, brushstrokes, cords, social context, time, and the artist/preacher/liturgical artist change. Those changes create repetitions, deepening the connection to the subject matter and creating space to extract the essence of the motif. 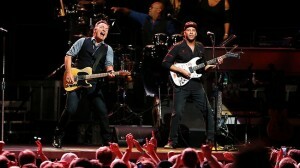 Watch Springsteen and Morello rock out "The Ghost of Tom Joad."